In 2014, the Department of Education's Office of Educational Technology launched its Future Ready Pledge. Since then, a team of taxpayer-funded individuals has been encouraging school leaders to sign the pledge. Just recently EdSurge published an article touting the U.S. states "most future ready." Except it's really a report on the number of districts in states whose leadership has signed the pledge. Signing a pledge is not the same as working towards being ready for the future. And when the U.S. DOE refers to "the future," what does it really mean? Five years? Ten years? Do they have any idea, or did "future ready" just sound like a good idea? And given that tomorrow never comes, I'm not really sure how one gets ready for something that will never be. However, snarkiness aside, let's take a look at some portions of that pledge. So in October 2014, personalized learning was becoming a thing; digital learning was already a thing, although not widespread. In all fairness, we have a long way to go before we really understand let alone implement "personalized learning" with any great effect so moving in that direction is a good idea, provided one knows what "personalized learning" could actually be in the near or more distant future. I could stop here, exhausted by the educational buzzwords. Yes, students need to be responsible, engaged, and contributing digital citizens, which means they have to understand what digital citizenship is and how to be a good digital citizen. But I am daunted by that first sentence. We have struggled for decades with "continuous improvement." We are earnest that we need to be improving continuously, but it has always been a phrase and has become more meaningless over the years. What are you improving? And don't say "student learning" because that doesn't mean anything any more either, especially if you're really thinking about personalized, digital learning, which means you need to be thinking about a LOT of moving parts. What is your starting point? Seriously. What is your starting point? You have to have an idea of what you're starting from to have an idea of how to measure if you're improving at all never mind continuously. Are you starting from the technology capabilities in your buildings? The kind of support in both training, development, and professional creativity and experimentation you provide your teachers? Are you starting with how involved your teams are in working collaboratively? Are you starting with the protocols you are using for measuring whatever you're measuring? Are you starting with equity considerations: the kinds of access your students have once they leave your buildings and how community organizations, and not just libraries, can offer support to students who don't have technology at home so they can continue to pursue that personalized, digital learning? How will you know you've improved and if you've done so continuously? And please don't say "test scores" because they can't really measure if you've implemented teaching and learning that is truly transformative and has led to any kind of improvement in your teachers' and your students' opportunities for personalized, digital learning? Future Ready districts conduct comprehensive diagnostic assessments of the district’s technology infrastructure and develop a sustainable plan to ensure broadband classroom connectivity and wireless access. 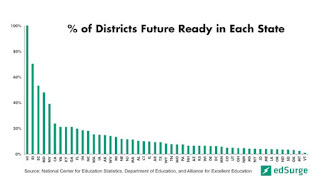 Future Ready districts work with community partners to leverage local, state, and federal resources to support home Internet access outside of traditional school hours. Do you have anyone in your district who can "conduct comprehensive diagnostic assessments" of your infrastructure? Who can develop a sustainable plan? Who can work with someone in the community to get a handle on the current demographics and forecasted demographic changes to begin to contemplate the veracity of the plan? Who can develop a timeline with benchmarks to review the plan to make adjustments as needed? Who will be in a position for some time to come or who might be replaced periodically when there are elections or other changes influencing that role? Do you have anyone in your district who can work with those community partners and with local, state, and federal resources, or who knows people who can and who can help ensure this team of people are looking out for the best interests of the students who will, in turn, influence the best interests of the community? What will you do if the technology resources in your community lag behind what you need in your classrooms? Chromebooks are the darling of the tech community today. They may be the darling for a long time to come. Even so, part of the planning needs to be about obsolescence but also thinking about making sure there are appropriate and timely options for teachers to learn how to use and integrate the technology--whether hardware or apps--in their classrooms as well as how to introduce same to their students and make sure their students are comfortable. Sure, kids are more tech-fearless than teachers, but it doesn't mean they automatically know how to use whatever it is effectively for learning. And how about them parents? Yep, let's not forget the parents. A Future Ready district may work towards tech equity, but that also means thinking about how to keep the appropriate technology accessible to students after school hours and making sure parents have some knowledge and comfort with what the heck is going on. Now I've been all Negative Nellie about this Future Ready idea because there is a huge potential for leaders to sign a petition to make their districts and their states look good but then have no idea what to do next. Fortunately, the U.S. DOE thought about that and they developed the 7 Gears "to advance toward successful digital learning." Even better, they've provided additional information and guidance for each of the gears. There are many that can be sticking points for districts, including the personnel charged with each gear. I believe technology will be one of the most difficult because that resource can be one of the most fluid but also one of the more complex for which to ensure some degree of equitable access in a wide range of districts, not just high-risk urban ones. So part of what they've done is provided some guidelines for leaders and their collaborative teams to review and use as they begin to think about what it really means--and I must emphasize what it really means--to put in place infrastructure, policies, and processes for working towards digital learning, for working towards what the future of learning and what students might experience as successful learning. So yes, let's celebrate districts leaders who have signed the Future Ready pledge. But let's not only celebrate but support as best we can those leaders who are using the resources available to work towards being ready for the future, and thinking about how to be adaptable for the future as it becomes the present. For those folks who are still struggling with the whole idea of being ready for the future? Keep in mind they may have too much to do to get ready for the present and haven't the wherewithal yet to think about the future. And let's stand with them to help them find ways to use these resources not only to do what needs to be done to engage their students in learning today, but begin to pave the way for them to be ready for their futures and the futures of the next wave of students. The bias of college lectures?